The “mutual devastation” experienced by Ascension and Livingston parishes in 2016 flooding has created “sensitivity when any project proposes to move water from one place to another” according to Congressman Garret Graves. Graves facilitated negotiations between the parishes to stay Livingston’s lawsuit enjoining Ascension from proceeding to construction of the long-awaited Laurel Ridge Levee extension. 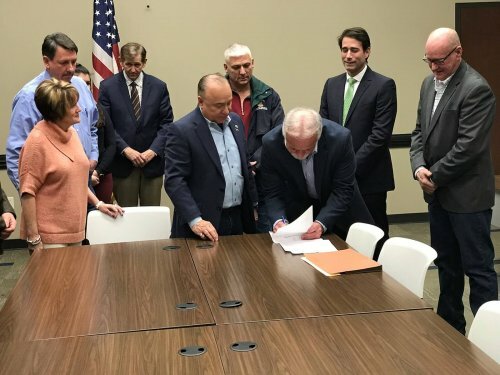 Parish presidents, Livingston’s Layton Ricks and Ascension’s Kenny Matassa, signed a “Memorandum of Understanding” to that effect Friday morning at Ascension’s Governmental Complex. Work preparatory to actual construction may proceed but building the extension will require Livingston’s engineers to verify no adverse impact on Ascension’s neighbor to the northeast. That is in keeping with the agreement to seek “regional flood protection without adversely affecting other parishes” in Graves’ words. Livingston president Layton Ricks inking MoU. “Just under 138,000 people are telling me, ‘don’t let them put water on me,'” Ricks explained the fears of his constituents, going on to itemize a list of projects being undertaken by his parish. Those projects, dredging of the Amite River most prominently, are possible because Livingston has already received many millions in federal flood mitigation monies. Friday’s agreement is possible because another $1.2 billion has been “secured and appropriated” through Housing and Urban Development” for additional mitigation focused on regional solutions. HUD has yet to promulgate requisite guidelines for allocation of those funds which were promised by the end of February according to a hopeful Congressman Graves. He cautioned that HUD is one of the federal agencies affected by the ongoing, unprecedented shutdown of the federal government. Ascension’s Matassa, along with parish Infrastructure Division Director William Daniel, assured that all data and study conclusions related to the Laurel Ridge Levee project will be shared with Livingston Parish. Two other parishes, East Baton Rouge and Iberville, have fought Ascension projects in the past. Graves assured those other affected parishes were in agreement with the spirit of Friday’s proceedings. one of three council members in attendance Friday. Graves warned that future projects will have to be assessed in view of already approved projects like the Comite Diversion Canal and West Shore Hurricane Protection (recipients of $343 million and $760 million in federal funding respectively).